Known as the Art Capital of the Philippines, Angono Rizal is the home town of National Artists Lucio San Pedro, National Artist for Music, and Carlos “Botong” Francisco, National Artist for Visual Arts. 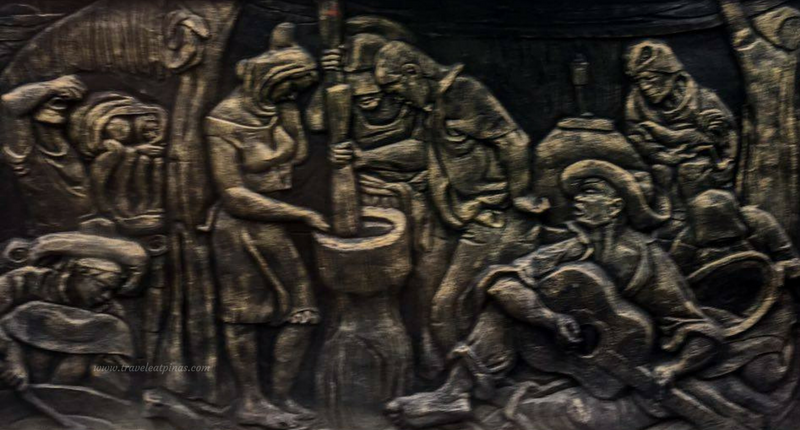 Aside from producing National Artists, Angono is also the perfect location to witness the work of art of emerging masters in the field of sculpture, carving and painting. Angono also houses the oldest known work of art in the Philippines that was declared a National Cultural Treasure in 1973. Higantes Festival in Angono, Rizal. A day tour in the Art Capital of the Philippines can lead you to four destinations that incorporate the art and beauty of Angono. 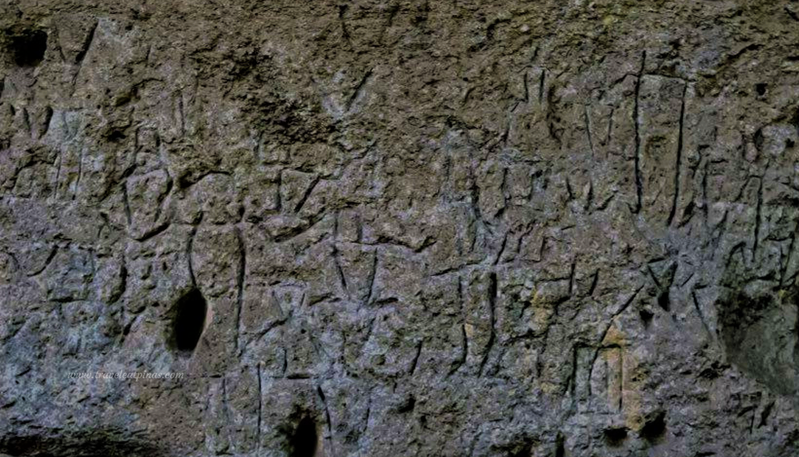 A man made cave serves as the gateway to Angono-Binangonan Petroglyphs. The cave is dark, cold and a bit mysterious. The cave is followed by a three minute trekking. Luscious trees and bushes line up at the side of the pathway leading to the National Museum Site. Museum Docent welcomes and orient the guests before heading to the actual site of the rockshelter. 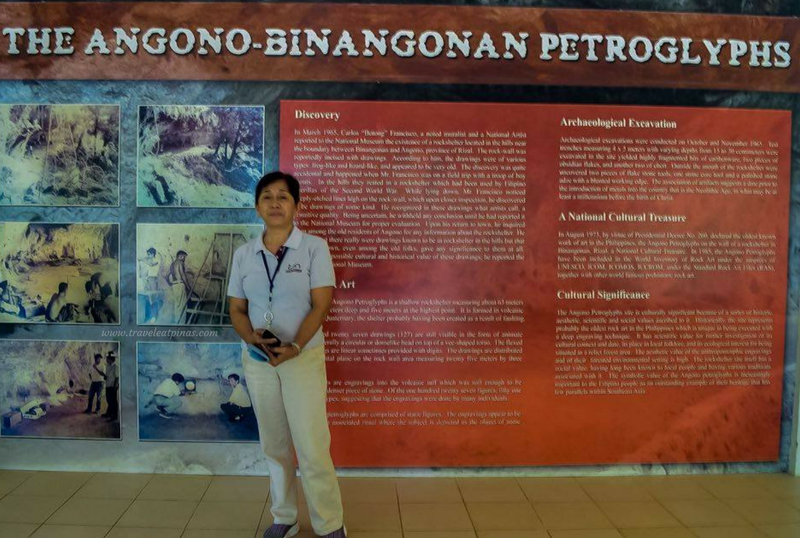 The orientation educates the guests about the history on how the Petroglyphs was discovered by National Artist Carlos “Botong” Francisco and how it was declared a National Cultural Treasure in 1973. National Museum Docent who educates the guests about the Petroglyphs. The petroglyphs is carved at a shallow rockshelter that measures sixty three (63) meters wide, eight meters deep and the highest point is at five meters. One hundred twenty seven (127) primitive drawings are visible in the rockshelter. Most of them are clustered and are in the forms of animals, person and other linear or circular figures. Prehistoric drawings located at the rockshelter. Unfortunately, some guests vandalized the rockshelter and wrote their names and other figures near the primitive drawings. To put an end to this unnecessary actions and to preserve the cultural treasure of the Philippines , the museum made a view deck where in an appropriate distance between the guests and the drawings is implemented. 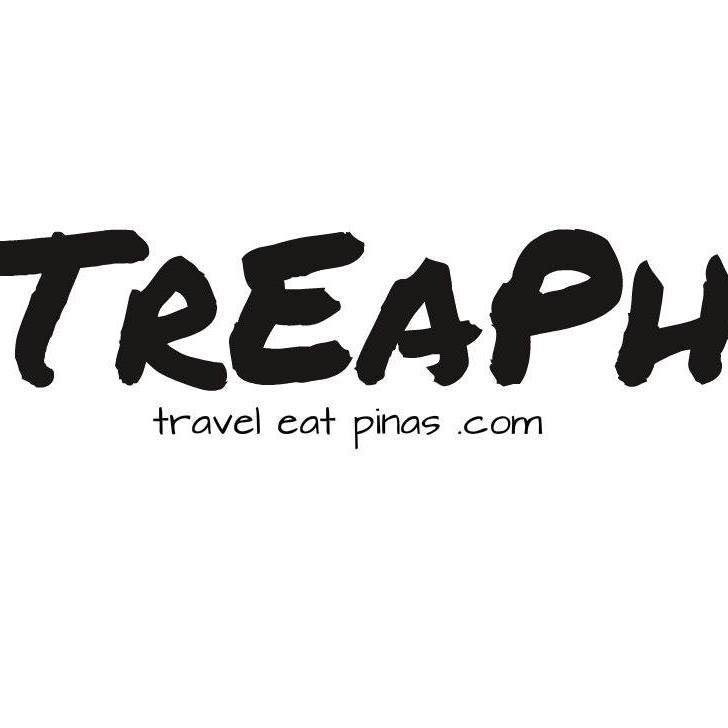 Monday to Sunday 8:00 AM to 5:00 PM. 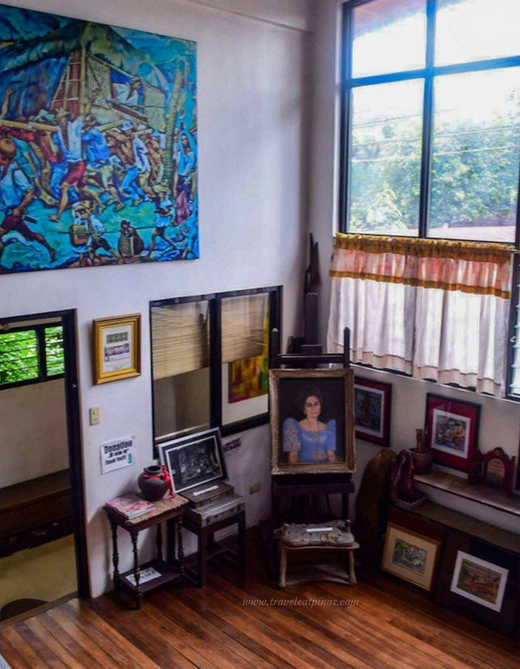 Muralist and National Artist for Visual Arts, Carlos “Botong” Francisco’s ancestral house is situated at Dona Aurora Street, Poblacion Itaas, Angono Rizal. His house serves as his museum where in his studio and belongings are well taken care of. 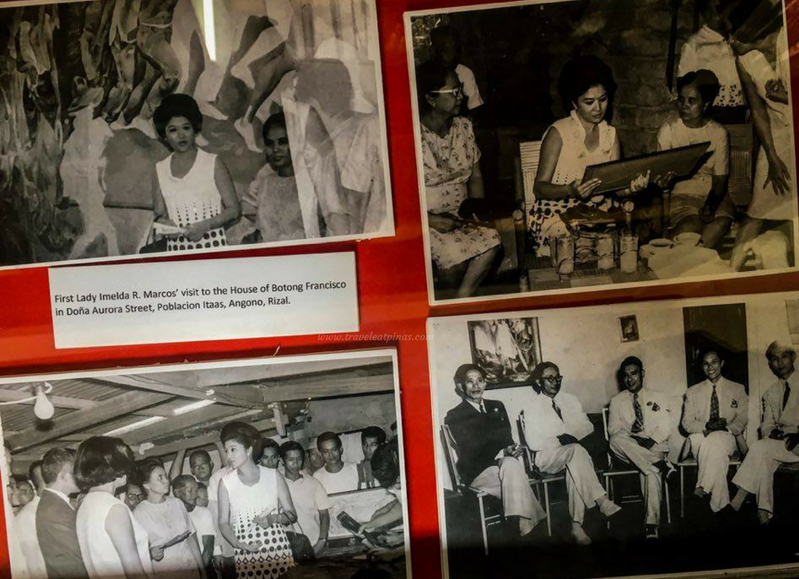 Photographs of Botong along with prominent personalities like the former First Lady Imelda R. Marcos were displayed at his studio. Along with the photographs are some of medals and recognition as an Artist. The paintbrush that he used on his artwork along with some painting materials remains at his studio. Carlos "Botong" Francisco along with prominent personalities during the Marcos Regime. His grandson Carlos “Totong” Francisco II manages the museum, like his grandfather, “Totong” is also one of Angono’s artist and pride. Along Dona Aurora Street lies the murals dedicated to Angono’s pride and homegrown artists, Carlos “Botong” Francisco and Maestro Lucio San Pedro. Concrete murals based on the actual paintings of Carlos “Botong” Francisco about rural life were installed on almost all the houses at Dona Aurora Street. Along with the works of Francisco are the lyrics and notes of the famous “Sa Ugong ng Duyan” of Maestro San Pedro. Charlie Anorico, Gerry Batang and Ebong Pinpino were the hands behind the concrete murals in Angono. Concrete Murals along the street of Carlos Francisco. 3. Walk until you reach E. Dela Paz Street. 4. Continue to walk at Dela Paz Street and turn left to Dona Aurora Street. Balaw-Balaw Restaurant and Art Gallery is located at 11 Don Justo, Justa Village, Angono Rizal. 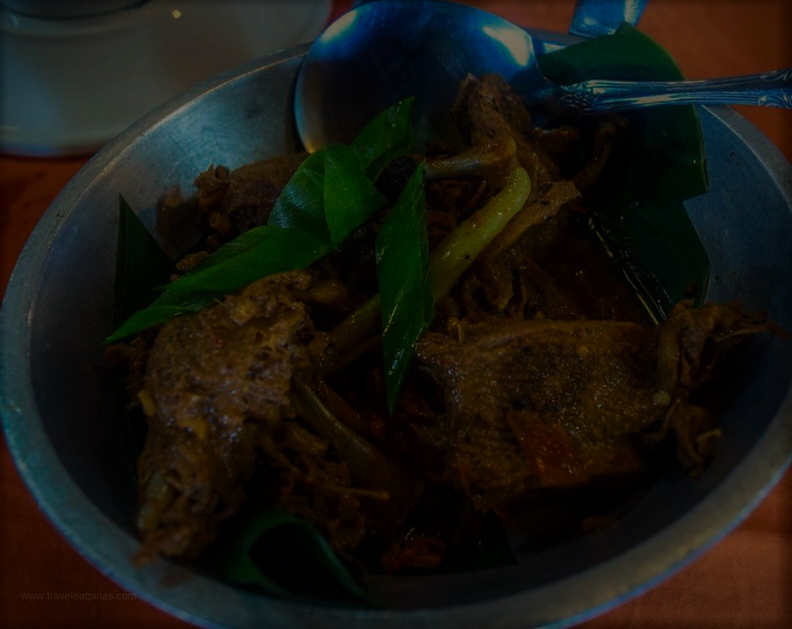 Balaw-Balaw is known for its Filipino and exotic dishes. 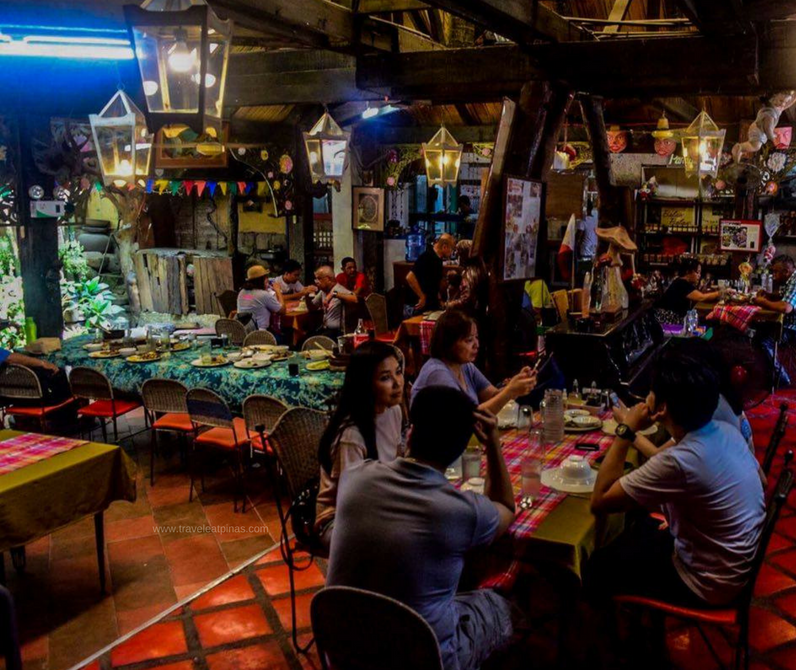 The restaurant exhibits the artistic side of Angono with its native nipa hut concept and distinct interior design. 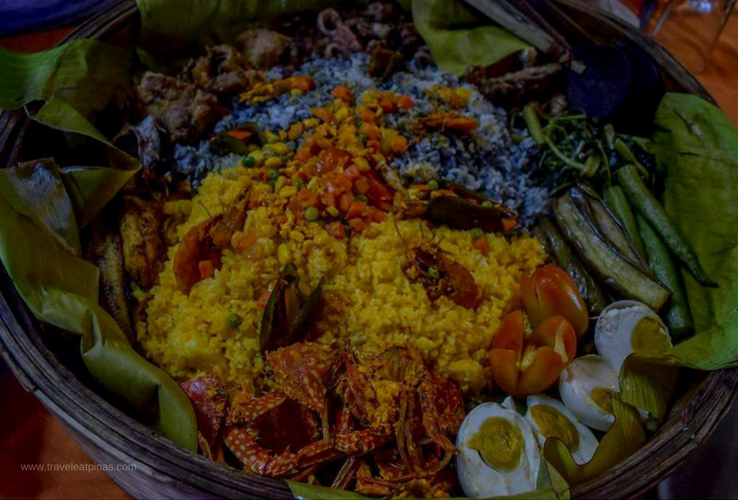 To date the restaurant serve twelve (12) kinds of Sinigang, exotic dishes such as itik, ginataang kuhol, sinabawang balut, and fares made of fishes that can be caught in Angono- kanduli, hito and dalag. 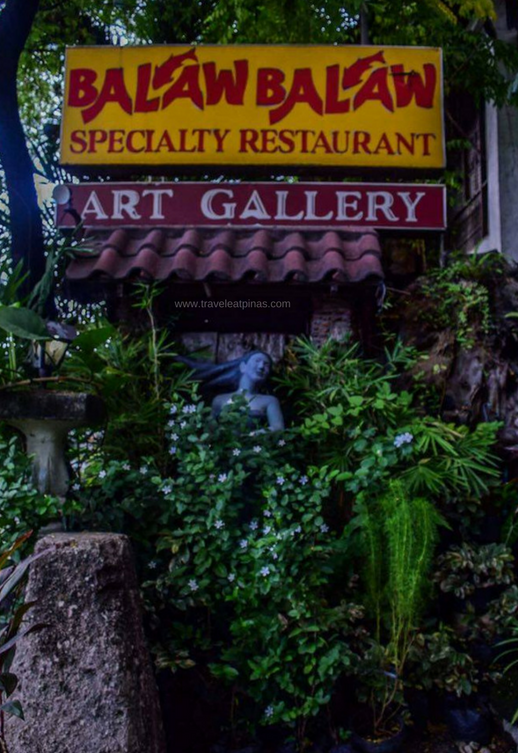 An art gallery with sculptures, paintings, and illustrations are displayed on the other side of the restaurant. Interior of Balaw Balaw Restaurant. 3. From Don Benito Street, turn right to to Dona Aurora. Blanco Family of Angono, Rizal is known as the family of Artist. 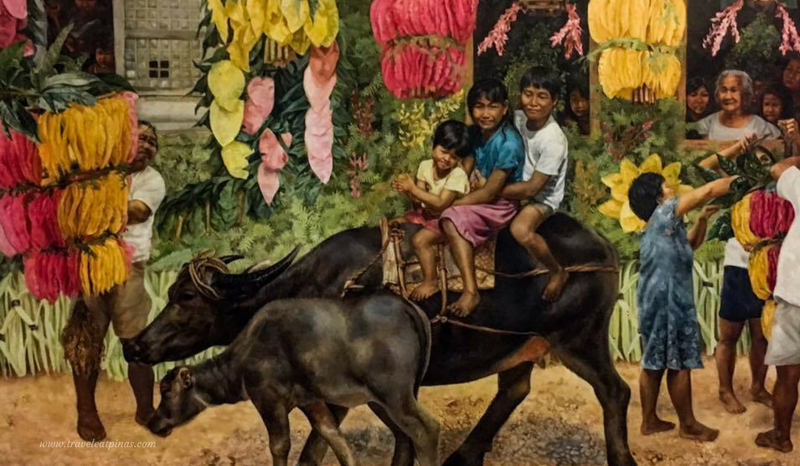 The head of the family, Jose “Pitok” Blanco, influenced his wife and his seven (7) children to create art work that depicts life in Angono, memories about their travel, and subjects that interest them. 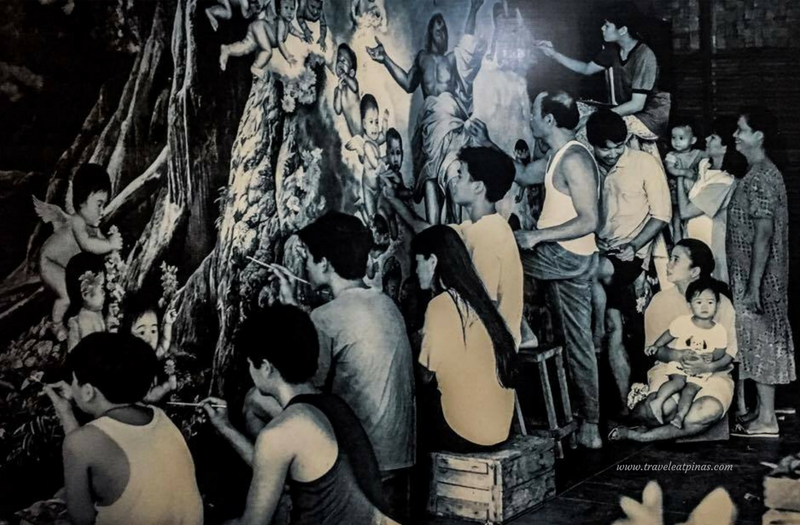 Blanco Family creating a mural for a church in Valenzuela City. The youngest Blanco, Peter Paul, started his work of art at the age of eleven (11) months.He grew up playing with colors and turning them in his own masterpiece in their family studio. Gay is the youngest daughter of Pitok. Contrary to everyone, Gay learned to draw first before she could start writing. She was exposed as an Artist during the family exhibit in Malaysia and Singapore. Peter Paul and the family's chicken. Jan is the fifth child of Pitok. He shows interest of making paintings of bird. 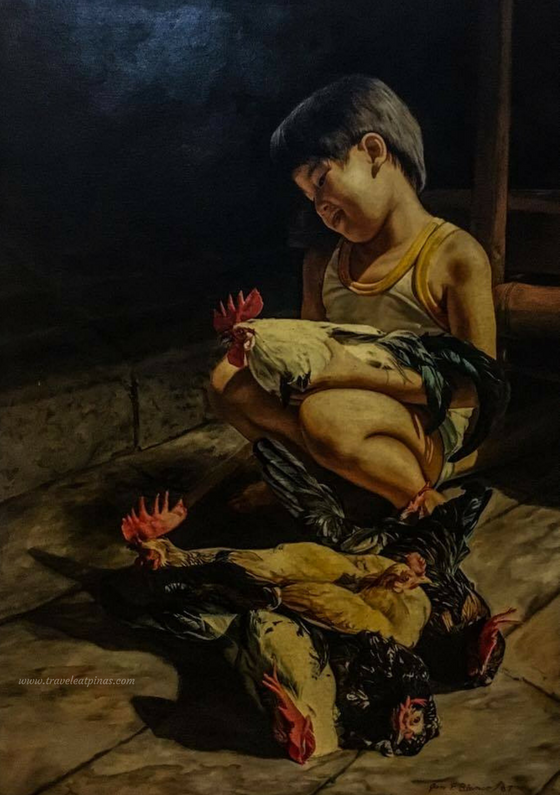 On his paintings he showed how birds are being domesticated and how some freely roam on the fields of Angono. Joy Blanco- Balcita is the eldest daughter of Pitok. Her favorite subject are people of all ages and in different walks of life. Pitok’s second son Michael started to draw at the age of 10. Among all the members of the family, Michael has the most outstanding portraits. Glenn is the eldest of Pitok. As a young artists he joined local and international exhibits and contest. He loves to paint nature scenery and landscapes. He also mastered the art of drawing and painting tropical fruits, vegetable and flora of rare authenticity. Loreto Perez Blanco is the loving wife, support and nurturing guidance of the Blanco Family. She loves painting mature woman and mothers that incorporate her feelings and emotions towards raising their family. Jose Blanco also known as Pitok Blanco is the head of the family. Pitok was born and raised in Angono, Rizal. 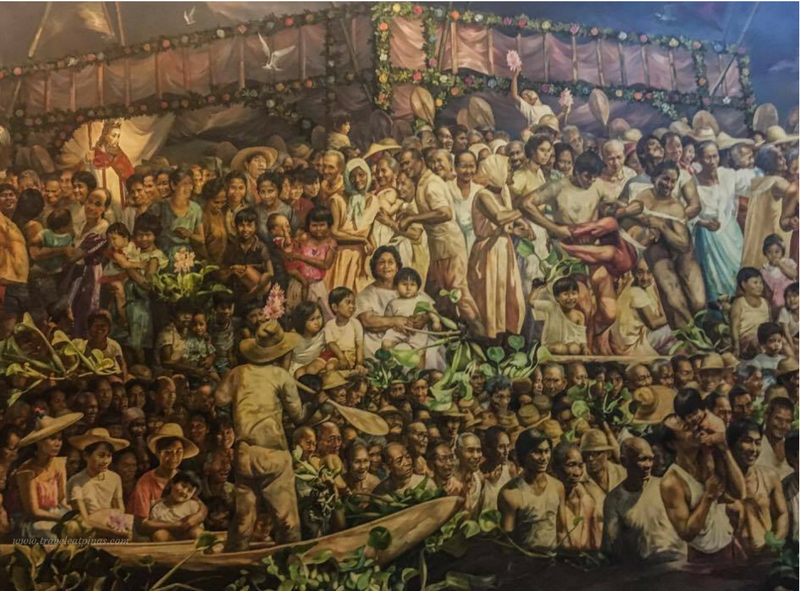 Pitok’s known work of art is the “Angono Town Fiesta”. It is an oil mural painting that shows the jovial celebration of the San Clemente Festival. 2. Alight at M L Quezon Avenue, Angono Rizal. 3. Walk right to Mauricia Diaz. 4. Then turn to Ibanez Street.